in the search tab everything is described in detail about their benefits, and only at the end of the article, to which very few people finish reading, under the modest name "Disposal and recycling" about dangers of FL are briefly described: The disposal of phosphor and particularly the toxic mercury in the tubes is an environmental issue. Governmental regulations in many areas require special disposal of fluorescent lamps separate from general and household wastes. For large commercial or industrial users of fluorescent lights, recycling services are available in many nations, and may be required by regulation. In some areas, recycling is also available to consumers. Only on the Russian site has information about what, that all fluorescent lamps contain mercury (in doses of 1 to 70 mg), a poisonous substance of class 1-hazard ("extremely dangerous"). Moreover, compounds of mercury in fluorescent lamps are much more dangerous than mercury metal. This dose is harmful if the lamp breaks, and if constantly exposed to harmful mercury vapor, they will accumulate in the body, causing damage to health. When the lamps life is coming to an end, it is typically thrown in the trash, and its fragile glass bulb is broken, the mercury settles in the chute or container, partially weathered on the way to the dump, and the begins poisoning the environment under the action of rain and wind for a long-term period. Individual consumers rarely pay attention to properly disposing the used up product, while manufacturers seek to move away from the problem. Legislation on RoHS (reduction from English. Restriction of use of Hazardous Substances Restriction of Hazardous Substances) regulates the use of mercury, lead, cadmium and other harmful elements in electrical and electronic equipment. July 1, 2006 Directive came into effect throughout the European Community. The aim of the Directive is obvious: limit the application of the six major hazardous substances in electrical and electronic equipment, thereby providing the required level of protection for human health and the environment. Each time you turn on a fluorescent bulb, the filaments at the ends of the lamp begin heating, after prolonged heating lamp filaments cool down, but eventually in a glass flask microcracks are formed, through which the mercury vapor lamp leave and get oxygen, oxidizing the filament and mercury vapor, which leads to filament failure. If the ends of the tubes began to blacken, then you are facing depressurization of the lamp! When working, low-temperature arcing appears between two electrodes located at opposite ends of the lamp. The lamp is filled with inert gas and mercury vapor through current leads to UV radiation. This radiation is invisible to the naked eye, so it is converted into visible light by the phosphor deposited on the inner wall of the lamp, which absorbs ultraviolet radiation and emits visible light. No one will give an accurate answer about what is with this conversion and how much UV and X-ray radiation passes through without converting phosphor layer. Measurements also showed that over time the brightness of the FL decreases, and thus the phosphor burn, the transformation is reduced, which leads to more UV radiation! Many people notice that the atmosphere in rooms where the FL work is not very good, this is due to the ionization from the UV and X-rays! Most people, even those with higher education and electrical engineering, are not aware that the lamp disguised under different names - "economical, fluorescent, compact, now even induction," all contain toxic mercury vapor, and at the end of the life of the lamp, as a rule, thrown in the trash, and its fragile glass bulb is broken, the mercury deposited in the garbage disposal or container, part disappears on the way to the dump, and the rest is long poisons the environment under the action of rain and wind. Most FL lamps contain electronics, which operate at a voltage of more than 330 volts and often fall victim to burst mains, which are no longer a rarity. Therefore, many have already seen that the FL seem to save energy compared to incandescent lamps, but not money! And sellers of FL lamps even advise if the lamp power is less than 15 watts, do not turn off her longer work! Savings?? Producers also do not tell about power consumption as the FL, while tests have shown that the most common lamps with electromagnetic ballast with two lamps to 58 watt at 220 volts consume 132 watts instead of the expected 116 and at 230 volts, which corresponds to the Euro standards, consume 143 watts! Lamps with electronic ballast, while being more economical and last longer, are inherently high-power radio transmitters, because the voltage of 50 Hz is converted into a frequency around 30 kHz, and the lamp is an antenna ! Then, if you look at how many lamps are hanged close together to get sufficient light, and to think that conventional incandescent lamps of similar power would give the same light, we would like to ask the Homo Sapiens "Why?" Only to poison themselves and keep vendors and manufacturers FL fun? People who studied in university, confirmed the calculations, that by replacing incandescent light bulbs with the FL, you get the same results. In civilized countries, where people are actively applying the FL, more people get sick and quickly die out LED lights. A lot is written about them now, but the common man in this volume of information will find it hard to understand! Most often a consumer is informed about the number of LEDs or power in watts, but that is not enough. More important things to know are the brightness of the lamp in lumens, and the angle of emission. Lamps with a lot of cheap, but not very economical 5 mm LEDs have not only failed to provide sufficient brightness (have the same impact as FL), but have a narrow radiation angle is usually 30 degrees. A small spot of light from them very few people meet and often used as an ornamental and intimate lighting. In addition, according to the theory of reliability than the more elements in the system, the lower its reliability, and this should be the main advantage of LED lamps. Lamps with a large number of 5 mm LEDs just suffer from low reliability, they are connected poorly, so after a while about 3-4 LEDs begin fading over time and then faster, and more. There are suspicions that their vendors are doing the FL to deter people from buying LED lights. Lamps with a small number (3-7) of LED each output to 3 watts, and are good indicators for brightness, but have small emission angle of 30 degrees, with maximum brightness with an even smaller angle. Most LED lamps sold in stores are produce in Asia, shipping them is expensive, so price depends on the size and weight, which is why they make them compact, with small (SMD) parts. In addition, if the LED gets broken and you try to repair it, then you will be upset, because finding the necessary parts for repairs in Europe will be next to impossible and ordering from Asia expensive. You are unlikely to achieve warranty repairs, because Asia is far. 1. Economical use of energy compared to previous generations of electric light sources arc, filament and discharge. Thus, the luminous efficacy of LED street lighting with a resonant power supply reaches 132 lumens per watt , which is comparable with the impact of sodium discharge lamps of 150-220 lumens per watt. 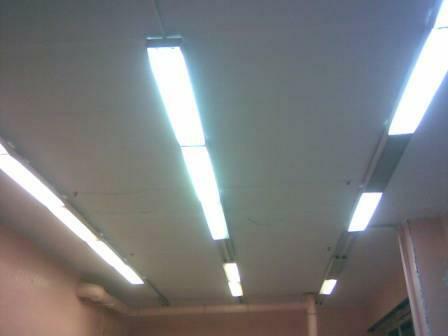 Fluorescent lamps have a luminous efficacy of 60-100 lumens per watt, as incandescent 10-30 lumens per watt (including halogen). 2. At the optimum power supply circuitry and the application of high-quality components, the average lifetime of LED lighting systems can be increased to 50,000 hours, which is 30-60 times higher compared to the mass incandescent lamps and is 4-6 times longer than most fluorescent lamps. 3. Opportunity to obtain different spectral characteristics without the use of filters (as in the case of incandescent lamps). 6. Highly resistant to physical damage. 7. The absence of mercury vapor (as opposed to discharge fluorescent lamps and other devices), eliminating mercury poisoning during processing and during operation. 8. Significantly reduces the hazard class of electronic waste. 9. Small ultraviolet and infrared radiation. 10. Little heat. Look up additional information at http://en.wikipedia.org/wiki type in the search menu "LED Lighting"